For more information on our products. Please send message to us. 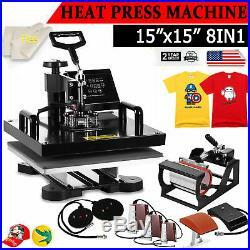 8 in 1 Heat Press Machine for t shirts Machine Combo Kit Swing Away Sublimation. What Customers Have To About Us. ” Delivered as promised and item is as described “. Just what i was looking for. Had a problem-was able to successfully resolve it. 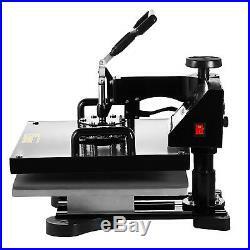 This 8 in 1 heat press machine can be used for T-shirts, caps, ceramic plates, ceramic tiles, mugs, coasters, mouse pads, jigsaw puzzles, lettering, other misc, fabrics & materials. It can transfer colorful pictures and characters of sublimating and dissolved printing ink onto ceramics, glasses and textiles such as cotton, flax, chemical fiber, nylon, etc. 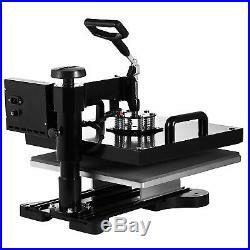 This all-in-one press includes flat platen, mugs and plates. 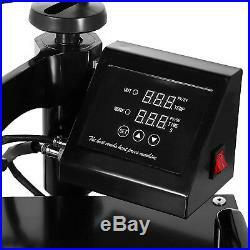 The swing-away heat press boasts all of the must-have attachments. 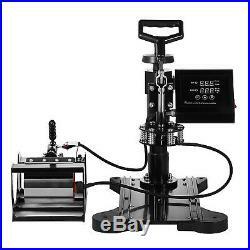 It has a built-in Teflon coated 15inch x 15inch (38 x 38cm) heat platen with a full range of heating coils to allow for consistency throughout its surface. The digital timer control is adjustable up to 999 seconds. The features a digital temperature gauge ranging from 0 – 250ºC (about 480ºF). 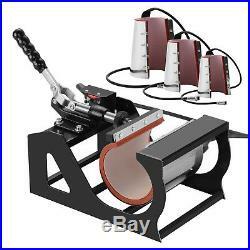 Large 15″ x 15″ transfer element – The 15″ x 15″ (38 x 38cm) heat platen provides a big surface to transfer onto flat surfaced items such as T-shirts, ceramic plates, mouse pads, jigsaw puzzles etc. Digital LED controller – Preset the desired temperature and timer. Intelligent audible alarm after the transfer done. Full 360-degree rotation of swing-away design – Allows the heating element to be moved safely aside and reduce the chances of accidental contact. 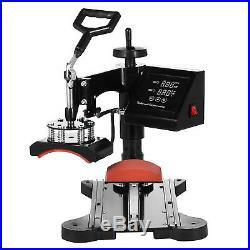 Full-range pressure-adjustment knob – This allows the pressure to be adjusted according to the thickness of the material you’re transferring to. Teflon-coated platen press element – The surface is non-stick, preventing scorching of transfers, and does not require a separate silicone/teflon sheet. 2 4/5inch Long arm handle- Comfortable rubber grip for everyday use and long production runs. Detachable lower platform – It is elevated with dual supports. 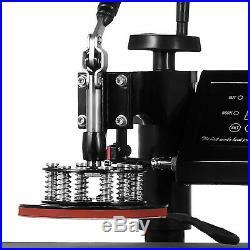 Adjustable multi-spring balancer – Allows pressure to be more evenly distributed across the entire platen when it is closed. 4/5inch thick heating board – Built-in structural support to maintain flatness. Warm up quickly and offer even heating. 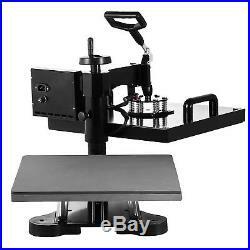 Application: This heat press machine enjoys multifunctions in one machine, it can be used for transferring on t-shirt, mug, plate, cap and so on. Moreover the heating accessory can be joined. It can swing-away 180 degrees and is convenient to take off the transferred materials and can be used for transferring on certain thick materials. 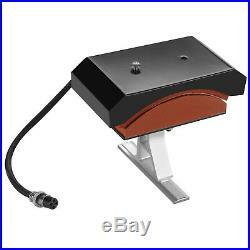 You can replace the heating plate easily and conveniently without using any special tools. Temperature setting: Press SET , the upper display will showing SP , and the lower of display will showing the temperature of last setting. Then enter into temperature setting option, press? Or? (increase or decrease) to set the needed temperature. After setting well, please press SET , the upper display will show SK to go on the next step for time setting Time setting: Press SET again, H1 LDE will showing ST , then enter into the time setting. Press? Or? (increase or decrease) to setting the needed time. (Normally the time is 180 seconds for mugs and 15-20 seconds for t shirt printing) Fault diagnosis and solution: 1. If the controller box showing nothing when power on, there are 2 solutions: a. Please check the fuse wire, checking the glass wire to see if the wire damaged or fusing, if damaged, please change the wire. Open up the back cover of controller box, and examine the electricity box, to see if some thread fall off or not, if fall off, please match it accordingly. When power on, if the controller display showing 3 lines, please take out the heating platen, and replaced it with another heating panel, or mug heater. If the display is normal, then maybe is the second situation of b , the thread wire were disconnect. If still showing 3 line, then is the first situation of a , the socket wire were fall out or break. Checking the inner wire of controller box, the white metal socket with 4 lines, please check if the thread is break or disconnect, if disconnect, please match it accordingly or replace it. Checking the wire of heating panel , the red cycle is showing the ends of the cable, one end is 3 thread, please replace 2 thread will be okay. When power on, the controller box showing values but cannot heating up: the display showing the actual room’s temperature, please takes out the plug of head machine, and replaced it with other mugs heater or plate heater. If temperature is heating up normally, then will be the next situation a , if cannot heat up, will be b situation. Checking the heating wire, the red cycle showing the ends of thread, please replace the white thread will ok. Open up the back cover, and examine the thread to see if some thread disconnected or break, if disconnected, please follow the above a , if nothing showing, please following b to maintenance. If no break, then replace the controller box. The head controller box heating up normally, the other parts will be not heating up, please change the heating part directly. The head machine’s function is ok, but cannot count down, then please press the third button, this machine will count down. If still cannot count down, please replace the controller box. 0 – 480ºF (0 – 250ºC). 0 – 999 Seconds. 13 1/2″ To 17″. 595 x 515 x 445mm. 15″ x 15″ (38 x 38cm). Hat / Cap Press. 6″ x 3″ (Curved). 2″-2.75″ diameter (6OZ). 3″-3.5″ diameter (11OZ). 12OZ latte mug (Cone). 17OZ latte mug (Cone). Fully-Assembled Machine With Platen Press. Removable Silicone Pad And Cotton Pad. Large 15inch x 15inch (38 x 38cm) transfer element. Digital LED temperature and time controller. Full 360-degree rotation of swing-away design. Fahrenheit and celsius scale are selectable. Teflon-coated platen press element. 2 4/5 inch long arm handle, bold handle easy to hold, save effort design. Upgraded aluminium alloy cradle. Metal and plastic construction. Sanding surface, comfortable felling. Automatic electronic timing when single table integrated, automatic alert when processes complete. Built-in fuse for safe using. Slides design make the changing of the parts easier and fast, save your time and effort. Novel, fashion, high-grade design, reasonable structure, easy operate. Adjustable feet for unevenly floor. 2 PCS Free Teflon Sheet. All items are dispatched from our warehouse in HACIENDA HEIGHTS, CA. Some products may be dispatched in more than one carton. International Buyers – Please Note. If you have a problem with the product. We will require a picture of the damaged part for verification. We offer detailed product descriptions and images to give you a real advantage in finding the products you’re looking for. 25 years Industry Experience. 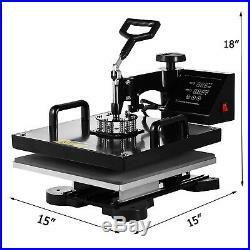 The item “8IN1 15×15 Combo T-Shirt Heat Press Transfer Mug Plate Machine Multifunctional” is in sale since Thursday, March 28, 2019. This item is in the category “Business & Industrial\Printing & Graphic Arts\Screen & Specialty Printing\Heat Transfer\Presses”. The seller is “lshd6783″ and is located in CN. This item can be shipped worldwide.